under fan palms as leeches grow between her toes. to reach the top of sorrow why so long she asks? mist splays in windscreen waves. she thinks the mountain is crying. buried deep. wrangling tropics of relations paradise. Dusk Dundler studied under Martin Harrison at UTS. He has published in the Prague Revue and Griffith REVIEW, produced for Radio National and reported for the Koori Mail. 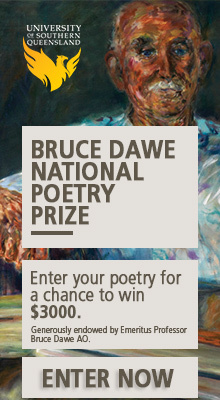 He was shortlisted for the 2012 Overland Judith Wright Poetry Prize.